Growing Up Green : LIVE FOR TODAY!!! LET'S GO TO A WEDDING PARTY!! Igor was my 7th child; my 5th son, also known as Cgor and sometimes Puerto Rico. He inherited my love of books, writing, deep thinking and Max's art. That isn't just one word...it's playing guitar, bass, drums and writing edgy lyrics all rolled up in one. 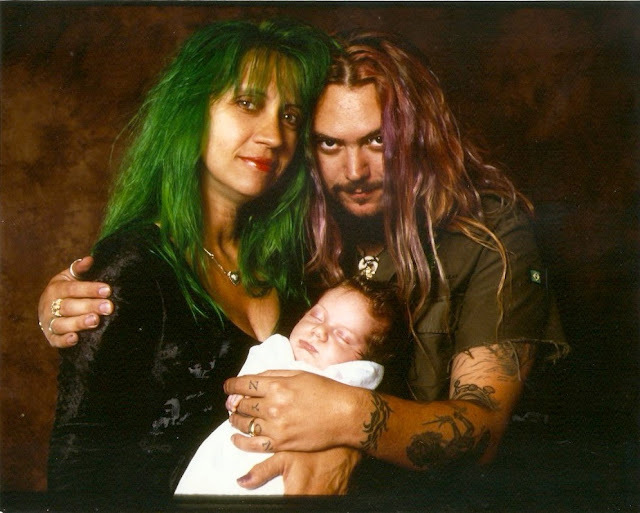 When he was born, Dana said he would be the doctor and Zyon was worried he was getting the green hair that Z was gyped out of! I was the first person in our family to meet Aggy. This tiny, vivacious spitfire caught my eye immediately. Bubbly, exotic and interesting to talk to, Aggy stood put in the crowd. I knew immediately that when Igor would meet her, he would be attracted to her...and he was. He joined me shortly after I met her and struck up a conversation. Anyone whose aka is Aggy Fleshgrinder surely would send rockets his way! Shove Time forward 6 years and here we are, packing for a bash!! It will be a rare time that most of our family will be together. Aggy's Dad and Mom have flown in with their family and Vania is on her way as I type. I may as well let the cat outa the bag....I ordained Max as a minister this morning and you can all guess who will be joining these Metal Ravens.... Yeah, you read that right! Now, let's hit the road!!! Live Life Large! !